One of My Favorite HIIT workouts: Tabata from Lindsay’s List, and advice for how to start! Today I’m linking you to one of my favorite blogs, Lindsay’s List, which also happens to include one of my favorite workouts, the Tabata. It’s a fancy word for moving hard and fast (HIIT means High Intensity Interval Training) for 4 minutes. Yep, 4, with rests in between the moves. Easy peasy. Start with one tabata. Get the hang of it, and go to 2 as soon as you can. It’s an awesome way to get started with HIIT exercising, and get that heart rate up, which is key in fat burning. HIIT was one of the keys to turning my body into a fat burner instead of a sugar burner. Now I do it because it works so well for a busy mom’s schedule and has kept me maintaining my weightloss for 2 years now! Woohoo! There are lots of ways to incorporate HIIT exercise into workouts, but Tabatas are an easy way to get started, with just 4 minutes. You can take anything for 4 minutes! Lindsay has several different lists of exercises you can do in your Tababta. I started with ones that didn’t require any equipment, because I didn’t have much at the time. Nowadays, I love my kettlebell and don’t know what I did without it! Oh, yeah, I got flabby and weak, that’s what I did without it! Boo. Now I know better. And you can too. This is such an easy way to get started! She also has videos on her blog, so you can see what the moves are supposed to look like if you need help. No matter what you do to incorporate exercise, here’s my advice: move long & hard enough to make you sweat so badly, that you wouldn’t want to be seen in public. Your face should be ugly by the time you’re finished**. If you’re just “glowing”, you probably didn’t work it hard enough:) And lastly, if exercise is not even a part of your normal routine (I was there! ), start with a movement you ENJOY, even if it’s just a walk through the neighborhood. Start with something easy enough to motivate yourself to do it. Figure out your schedule, commitment level, and then get into the HABIT of moving (some activity you enjoy). After it becomes a habit, a normal part of your weekly routine (at least 3 times/week), THEN you can move on to exercising for health benefits (harder, faster, stronger, more often). But just to get started, create the habit and routine first. If you’re already consistently incorporating exercise into your routine, that’s awesome! Tabatas can be as difficult as you want to make them, so go check this link out below! Sweat is fat crying. Go make your fat cry!! **See “uggie face” below, so you’ll know what I’m talkin’ ’bout! And finally, here is the link. Keep Calm and Tabata. 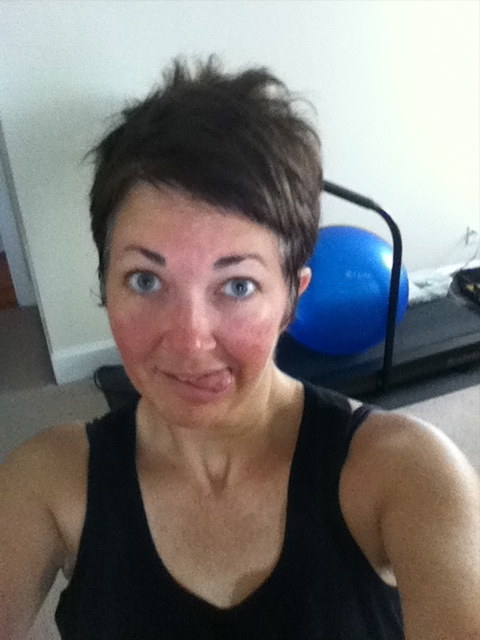 Tuesday Trainer – Tabata –. Do you guys have any HIIT exercises you recommend? Share in the comments if you do!